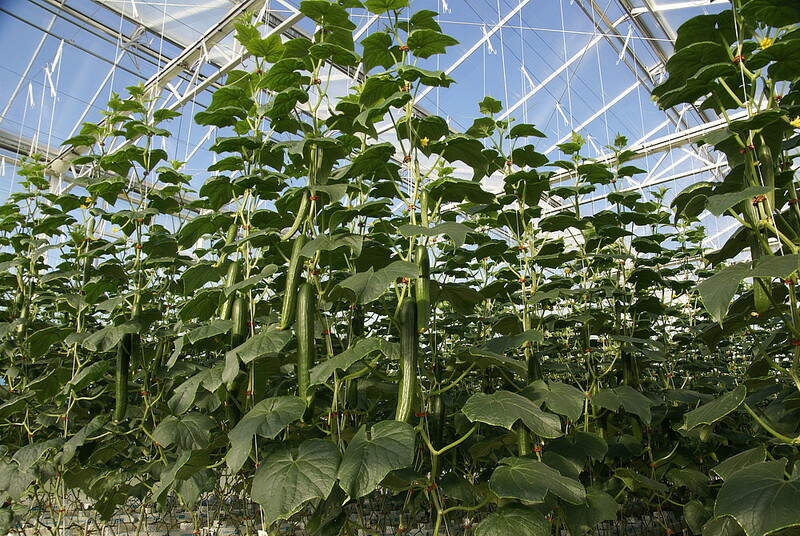 De The 2SaveEnergy greenhouse at Wageningen UR Glasshouse horticulture appears eminently suitable for the high-wire cultivation of cucumbers. In the double covering, a combination of glass and a film (F-clean) is used. The first harvest from the start (end of December to June 24) yielded 150 lots, or 64 kg cucumbers per m2. This pilot is a preliminary study for the coming trials in the winter-light greenhouse with 10% more winter light. The variety of the high-wire cucumbers was Hi-Jack. They were planted out on December 29 at a density of 1.67 plants/m2 in aisles of 1.4, 1.6 and 1.8 m wide. Later the plants were doubled by topping. At one point there was a crop with strongly generative growth and small leaves, but they produced many cucumbers. Over 6 weeks (weeks 15 – 20) the crop produced 10 cucumbers per week or 4.5 kg/m2. Apparently, the plants dealt very efficiently with their assimilates. The temperatures reached were rather high, which led to rapid growth of the cucumbers. Over the entire period the development time was around 14 days on average at an average greenhouse temperature of 21.4°C. The aisle widths of 1.4 and 1.8 m had the highest production. In the new winter-light greenhouse an aisle width of 1.8 m will be used because tasks using the high-wire trolley can easily damage the plants if the aisle is only 1.4 m wide. Calculations indicated a clear link between the production and the interception of light. This was minimal at 1.6 m. By the end of cultivation, the use of gas and pure CO2 totalled 12.7 m3 and 1.5 kg, respectively, per square meter. This represents a savings in gas consumption of 45% compared to the practice. In mid-July a new crop of Hi-Power was planted at a density of 2.25 plants/m2, with again the same three aisle widths. There was thus a gap of three weeks between the end of the first crop and the start of the second. We planted it somewhat later because we wanted to test the crop in the dark period as far as possible. At the end of August, this crop had already yielded 44 cucumbers with an average weight of 430 g. If this good yield persists to the end of the second crop period, it would be possible to realise an excellent total production of good-quality cucumbers. In mid-December a new high-wire cultivation will start in the winter-light greenhouse. This project is financed by the Kas als Energiebron programme [Greenhouse as source of energy], the innovation and action programme of LTO Glaskracht Nederland and the Ministry of Economic Affairs.